While teaching, Pearl completed her first book length work, a finalist for the 1999 Chapters/Robertson Davies prize for unpublished first novels. 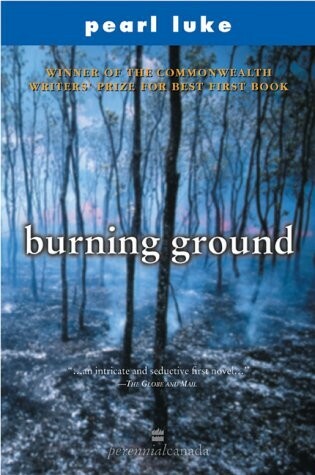 Published to critical acclaim in 2000, Burning Ground (HarperCollins, 2000) was named a Globe & Mail notable book of the year. In 2001, it was nominated for the Georges Bugnet award, the Canadian Booksellersâ�� Libris award, and won the 2001 Commonwealth Prize for best first book in Canada and the Caribbean. Pearl Luke was writer in residence for the City of Taipei, Taiwan in 2000. She and her partner, author Robert Hilles, have facilitated numerous writing workshops around the country, and offer private workshops on Salt Spring Island, one-on-one writing consultations, and online mentoring programs. Pearl Luke's second novel, Madame Zee, was published to critical acclaim in 2006. It was nominated for the 2008 International IMPAC Dublin Literary Award, and was a Chataleine and Canadian Living Book of the Month. All writers benefit from editorial advice, and in todayâ��s tight publishing market, it is especially crucial that manuscripts receive candid feedback and careful editing before they are sent out for potential publication. Pearl Luke mentors beginning and intermediate writers through all aspects of writing: planning, first drafts, editing, rewriting, queries and submission. She assists with query letters to agents and editors when books are ready for publication, and generally answers any questions related to writing fiction and non-fiction. Pearl Luke has an M.A. in English Literature and is the author of two novels and dozens of non-fiction articles. She has been editing fiction and non-fiction since 1989, when she got her first freelance assignment with Red Deer College Press. She went on to work for Detselig Press, Carswell Publishing, and the University of Calgary Press before changing her focus to teaching. She mentors creative writers privately and through the University of British Columbia, and she teaches Advanced English Composition for DeVry University Online. NEW program! Monthly feedback as low as $150/month! This is a very engaging opening to a character-driven novel, and what I read certainly makes me want to know more about xxxxxxxxxx. In only a few short pages, I have a very good sense of who this man is now, and I want to know what becomes of him and how he changes over time. How much violence and misfortune awaits him? I hope not so much that he is destroyed, because already I am rooting for him. Thatâ��s a significant accomplishment in only nine pages! I was reminded of John Steinbeckâ��s, Of Mice and Men, which may be a useful book to read and reference when deciding what sorts of scenes to include in your own story. In choosing an omniscient narrator, you have chosen the most difficult narration style of all, and I will address this further on. A few pages of what will be a lengthy manuscript canâ��t say much about the organization of an entire novel, and many decisions will have to be made here: Will the story be structured in three or four parts? Will the exceptionally poor treatment of xxxxxx to age 18 be relegated to a short prologue, or can it be expanded to an entire chapter or section? Certainly the order in which events are shown at the moment suggests an understanding of the importance of cause and effect in scene building, and that bodes well for the whole, as each dramatic turning point causes the character more hardship than the one before. The characterization of xxxxxx is a genuine strengthâ��perhaps the greatest strength in this excerpt. And as I mentioned in the general comments, the character takes on life very early, so that by the end of the sample pages I have a strong sense of him. You accomplish this best when you show xxxxxxx in action, providing us with concrete details of what he sees, feels, smells, etc., and when you provide his interior thoughts and questions. He really begins to come into focus when he kneels in the outhouse and extracts the small tin box with the â��child prince painted on top.â�� The entire next paragraph concerning his departure is very well wrought and filled with the sorts of details that are necessary to breathe life into a character and hold a readerâ��s interest. At times, I did long for more, however. For example, what thoughts does xxxxxxx have as he leaves the farm and walks toward his destination? Is he excited? Afraid of being caught? Does he fear the unknown as some do, or does he welcome it? Why? Will he miss anyone in Poland? Will he miss the landscape or the animals? Does he have any mixed feelings at all or is he entirely elated at the prospect of a new life? Or is he merely taking pragmatic action? Have his emotions been numbed from brutality, as might be suggested halfway down page 2 when you write, â��[he] did not dwell on it. What difference did it make?â�� And physically, he has rags in his boots. Do his feet get cold? Do they blister? Does he hobble into port, or is he able to find a ride for part of the trip? Dialogue doesnâ��t come easily to a lot of people, primarily because we write so much differently than we speak, and because it is necessary to edit normal speech so it is not deathly boring. But, for the most part, the dialogue in this excerpt has been handled very well, though there is not yet a lot to judge. You know the value of brevity and truncation in speech, and you use these to advantage as you convey the rough tone of the adopted father, and xxxxxâ��s wish that his coworker not touch his tools. Occasionally, however, attempts to accurately imitate enunciation patterns draw unnecessary attention, as on page 5 when the housekeeper says, â��What chew wan, young man?â�� These sorts of imitations, while occasionally useful, become distracting unless kept to a bare minimum. A clear sense of setting, while not entirely omitted, is largely absent in this piece and would add necessary texture. I wonder, for example, what xxxxxx sees on the â��three mile ride from school to the farm.â�� Is the landscape flat or hilly? Lush or arid? Covered with snow? Obscured by fog or mist? Are there ruts in the road or is it paved? Is it in fact a road at all, or more of a trail? What does he see on the walk to the port where he ships off for America? What are the conditions of the ship on which he travels? You tease me with Clevelandâ��s â��long blocks of drab grey brick buildings,â�� but provide no more. Are these factories? Office buildings? Homes? Low or multi-storied? Are there lamp posts and trolley wires? Litter on the sidewalks and in the gutters, or is the city clean and well kept? What does xxxxxx register in this new land? How is it different or similar to what he knows of Poland? In a novel, often there is an overall sense of setting that adds meaning to the themes of the story. Will this be in the machine shops? In a home? A farming community? You wrote this excerpt very honestly, so that the character of xxxxxx felt entirely believable to me. A reader could not root for a man who reacted so violently without his having been characterized and depicted honestly. Additionally, important facts did not scream out as superfluous research fitted in but were interesting additions, as they are meant to be. On the other hand, his entire world will be improved and made yet more believable with more detail. Writing is all about detail, detail, detail. The tiniest detail can make something infinitely more believable; the wrong one can ruin believability altogether. As noted in the general comments, you have undertaken a difficult task if you wish to write an entire first novel in the omniscient point of view. Used unskillfully, there is a danger that shifting viewpoints and author interventions will interrupt the â��suspension of disbeliefâ�� so necessary to the reader. As author, your primary goal is to create a world into which the reader will be immersed, not surfacing until the final page. Clumsy changes and interventions can destroy the illusion of reality you hope to create. Most of this excerpt is written from a limited omniscient POV, whereby we expect to know everything xxxxxx sees, hears, feels, thinks, etc. He may even comment on and interpret events or the behaviour of others, but we only acquire information through his limited POV. That changes, however, when you introduce the doctorsâ�� POV. I found this change jarring, and was not prepared for the switch. Iâ��m not saying it is necessarily unwise to attempt the omniscient POV, only that it should be a conscious choice, and will require much more skill, careful editing, and diligent attention than a limited omniscient perspective. The major theme apparent from this excerpt is that through strength, intelligence, and perseverance, adversity can be overcome. This is an always-popular theme. You exhibit much technical proficiency in terms of general writing ability, and if you wish to write a novel, I have no doubt you are capable of it. You handle well the narrative elements of the story except where noted elsewhere. Also, your grammatical proficiency is well in evidence. That said, there are a number of small improvements you could make. In a small number of sentences there are tense problems, and a number where word choice could be better, such as in the second sentence, where â��squirtedâ�� suggests something wet. Also some sentences are in need of tightening. However these kinds of editing changes are typical of what all writers must undertake during completion of a manuscript. Also, novel writing is a skill set in itself, and these skills may need to be learned or honed. As I said in an earlier email, I believe novelists spend entire lifetimes honing their skills. Specifically, to begin, providing more of a sense of a story question would help to initially engage the reader even more. What is it that xxxxxx wants? What drives him and propels him through life. There needs to be some driving desire behind everything he does, and that needs to be clear to the reader. Secondly, my general advice is to slow down and fill in details, creating scenes that show (not tell) what you want to convey of his life. Your style is honest and engaging, easy to read, and interesting. Some of the writing is beautiful, suggesting a literary novel, as when you have him â��avoid the brutal criticism of xxxxxxxxâ��s boot,â�� or when you write insightfully, for example: â��Mostly, people ignored him which was fine with xxxxxx because he didnâ��t have much he wanted to say.â�� There is, however, a tendency to tell the reader about events that should be shown for maximum interest and tension. You have a good sense for moving the story forward and I realize there may be a lot of material you want to cover, but it is crucial that you slow down and fill in the details more. At the bottom of page 3, for example, you tell us how xxxxxxx returned quickly after delivering some meat and saw the farmer with the cash box. This info would be better served if you created a scene and showed us these events in real time, especially as it is a pivotal moment, the one event that allows him to see a way forward, out of the miserable existence he has lived thus far. To turn this excerpt into the opening pages of a novel, it will be beneficial to begin at the top of page 3. That is a strong and riveting moment that will immediately draw the reader in. You can then backfill some of the details from the previous pages in new scenes that show these events. To begin with, it may be most useful to decide whether the time in Poland is a prologue or a chapter. I suggest a chapter, as there is much of interest there to fill in and elaborate on, as I have suggested in questions above. Perhaps chapter one would end with xxxxxxx watching as the farmer hides the tin of money, or later, when he steals it and sets off for the boat. Most important is determining exactly what drives him. At an emotional level, is it the desire to never be mistreated again? To be master of his own destiny? Has he heard that people can become rich in America and live a life of freedom? Is that what he wants? Whatever it is, it must be big enough to drive everything he does. From there, you can determine which scenes will best show his actions to achieve his goal. Bear in mind that while the book has a driving purpose, each section and each scene must also have its own goal, frustrations, and climax. Who wants what, and does that person achieve his goal or is s/he somehow frustrated? The more they are believably frustrated, the more tension your novel will have.